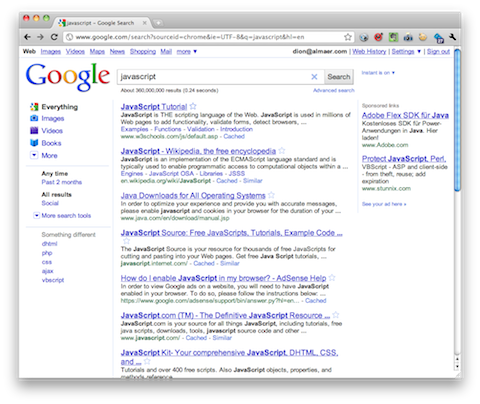 Compare to a search for Java, or C#, or Ruby, (or ….). If we can do half of the work to promote this as we have with the awesome VaporJS library, then we should be in a better place. Editor’s note: This was posted by Dion but he had no way to push it live. I am doing this now. 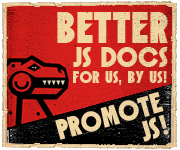 To find out about my personal stance on this very cool idea, check out Why supporting promotejs is a good idea. And then get developer.mozilla.org on the penalty list for black hat promotion (just kiddin’ ;-). Good initiative: it would actually be good to have multiple sources that are being promoted. But then again, can you name good documentation resource websites? Let the beginners play with snow.js and “animated status bar text”. That’s all they need to know. Knowledge should not be made simple, as it is a threat for people who already have it. Bing gives good results… And yes i work for microsoft (start the lambaste now). Please don’t take this personally, I don’t know you or your work. I’ve found that, often, programmers who are threatened by growing skill in their ranks (either a larger pool of competent programmers, or those programmers growing more talented) have themselves stagnated or have little idea how to market their work and their skills. The latter is a fair limitation, and is pretty common among programmers anyway. But ultimately, greater skill among a broader set of programmers serves all programmers to some degree; it allows for more specialization, for workers to choose their work more carefully, and for us to set ourselves apart not just by our skills but by our unique talents and interests. Programming shouldn’t be an elitist occupation. I’m sure I’m not the only one here who is essentially self-taught but has had enough interest and put in enough work to become professional. The information is out there, it’s free, and it’s empowering. The more people taking advantage of that, the better. As a side note, if you’re concerned that too many people are becoming talented as they take up web programming, a cursory glance at places like Stack Overflow should be plenty of relief. Newbies still take time to get caught up, and the field moves on as they play catch up. There will always be degrees of skill in programming. By promoting improved skills among current newbies, we free ourselves to mentor them as they improve and let them mentor *their own* set of newbies who come along. I wonder if “newbies” are actually going to learn JS, in the sense of “studying the language and becoming an expert at it”. What I’ve seen in my experience hiring front-end developers is a sincere belief that their knowledge of libraries and frameworks (such as jQuery) makes them JS developers. And that’s the point: they in fact are, as the definition of a JS developer (programmer, or whatever term you like) has changed. As in other industries, such as engineering or law, a very large part of the work requires no real “skill” in the sense that it is so well known that it can simply be taught in a 2 year college course. Outsourcing exists for just this reason. Indeed, it is why some of us build frameworks — to reduce the price of development, including labor. So while @mihaiu is probably joking, the suggested flood of competition won’t happen across the totality of the landscape, but will accumulate in the crevices and lowlands of landscapes created by those with true genius or something like it. Successful software development has little to do with perfect code, if you think about it (or have used software). The winning skills are higher-level. 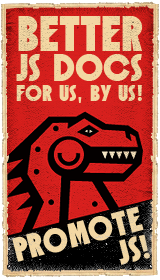 I love the BETTER JS DOGS ad. That doggie looks fierce. Where can I get one?